I'm a 22 year old Communications Graduate based in Brisbane ready to divulge all the wonderful things our sunny city has to offer! For all you film buffs out there, the Gold Class Experience provided by Event Cinemas is a must do. Gold Class is the ultimate luxurious cinematic experience. From the elegant lobby and bar lounge, where you can sit back and relax in prior to the film viewing, to the delicious food and beverage menu and exceptionally comfortable reclining chairs, you are left feeling like a Hollywood star from start to finish. Over the weekend I attended a Gold Class Session of the new Quentin Tarrantino film Django Unchained. While the film was amazing (can you expect anything less from Tarrantino? ), it's the Gold Class experience that I have been raving about ever since. Unlike the normal cinemas, the Gold Class Sessions are privately accessed through sliding doors. Once you have checked in with the staff member, you enter the elegant bar and lounge where you can enjoy cocktails and other beverages while waiting for the seating to begin. It is also at this point you have the opportunity to read over the extensive menu and place your food orders. Entre options include (but are not limited to) Buffalo chicken with blue cheese and celery, French fries, spicy dynamite squid with firecracker aioli, beer battered onion rings with chipotle BBQ sauce, and steamed chicken and garlic chive dumplings. 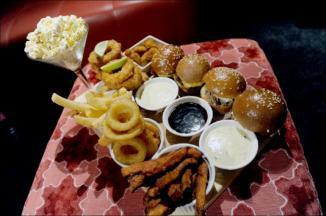 Mains available include beef and pork burger sliders, pizza, fish and chips, and nachos. On this occasion, my boyfriend and I ordered a 'Carnival Platter', which is a plate designed for sharing that included the sliders, onion rings, squid, fries and buffalo wings. The platter was the perfect choice for the two of us, as it allowed us to try a little bit of everything. When you order your food and drinks you have the option of deciding at what point of the film you would like your food brought out. As we bought a round of drinks at the beginning of the film, we opted to have the next round come out with our Carnival Platter. For those with a sweet tooth, you wont be disappointed with the dessert menu on offer, which includes a banana split, Spanish churros, and Belgian waffles. When it was time for the film to begin we were shown to our seats. Another plus of the Gold Class Cinema is that it is a far more intimate setting, with only 30—40 seats in the entire cinema. It was so wonderful to be able to kick back in the reclining seats and have our drinks and food brought straight to us. I even spotted an elderly man dozing off before the film had even started – obviously enjoying the comfortable seat a little too much! The electronic recliners, private bar and lounge, top class food and waiter service provide the ultimate luxurious experience. 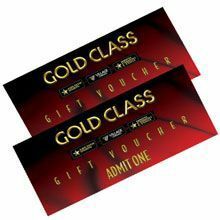 Event Cinemas offer Gold Class vouchers too; a Gold Class voucher would make the ideal birthday or anniversary gift for a loved one. Sessions book out very quickly, so it is imperative that you ring ahead to book. Visit the Event Cinemas website for your closest location and session times. VALENTINES DAY MOVIE SPECIALS – 1300 Flowers have teamed up with Australia's leading cinema group, which comprises Event Cinema's, Greater Union, Village Cinemas, and Birch Carroll & Coyle, to offer customers a roses and movie deal for Valentines Day. Click the link below for all information and the terms and conditions pertaining to the fantastic offer. NOTE: People under the age of 18 must be accompanied by a responsible adult at all times, as Gold Class cinemas are licensed premises. Proof of identification may be required before an individual is permitted to purchase alcoholic beverages.